This is it…. the final Daily Dig diary for the People of the Heath project…. and what a project. 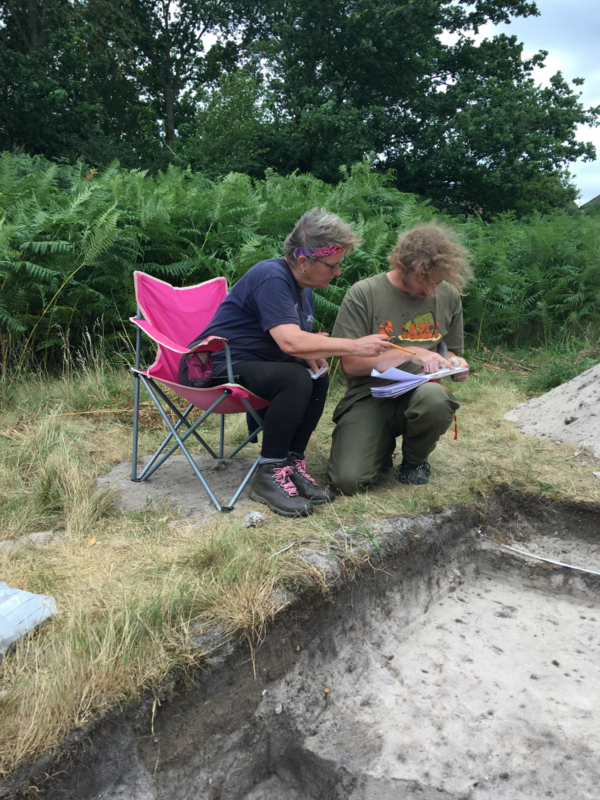 This seasons excavations have left us with two more urns, possible evidence for late Bronze Age use of the heath, the best evidence for Paleolithic man on the site and potentially the largest Bronze Age burial pit known in the UK! The question is where to start my round up?! Barrow1: The excavation of barrow one confirmed it as a Bell barrow with a mound that had its turfs covered by the fill of an enormous 4.5m deep ditch! It was also where the bruised blade, the first definitive Palaeolithic tool on the heath! Barrow4: We established that the ditch was external to the bank. It allowed us to discover more about the construction methods of the bank where the sand bank was clamped together with turfs. 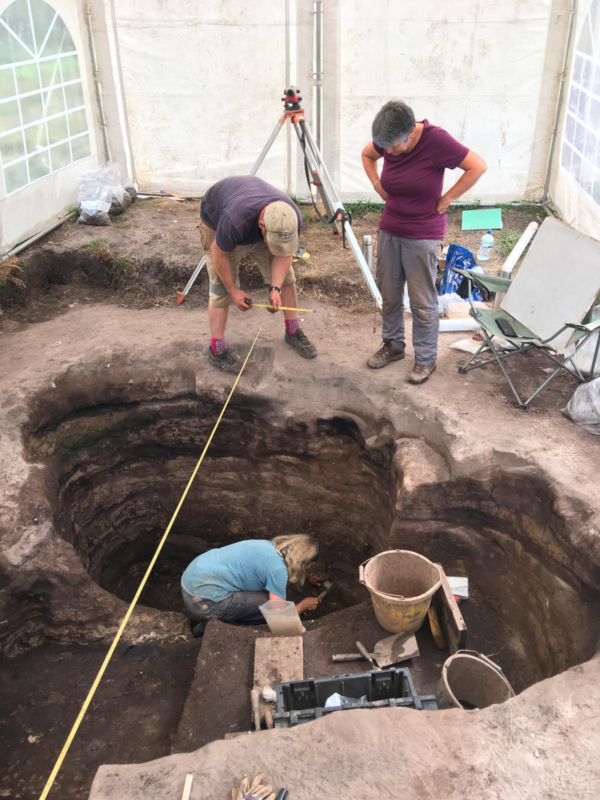 There are a number of different ancient features that have been uncovered at the base of the mound at Barrow4 but unfortunately we will not be able to excavated them and find out more. That means that Barrow for still leaves us without a burial feature. 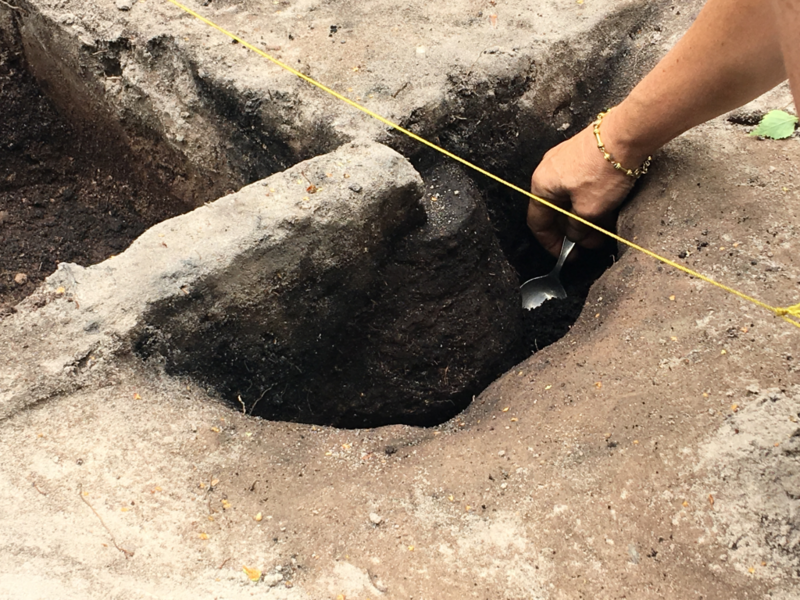 The Mesolithic floor: The base of the hearth has been reached and shows us that it was a fire pit. Within the fireplace more hazelnuts and charcoal from the occupation (c.9000 years ago) have been found. Included in the bucketful’s (literally) of flint s that have been found from the site are some very nice examples of blades and an example of a late Mesolithic microlith, again extending the time periods of occupation on the heath. Barrow14: We now have a burial in Barrow14. An urn has been discovered and is as I type being very carefully excavated in order to be able to lift it. Unfortunately it is not complete with one of the sides having eroded away. Despite this it looks like the rim of the pot may still be intact and it will be exciting to see if it can still be lifted in full. Along side this urn a small metal object, possibly a late Bronze Age ring has discovered today. Once it has been examined fully it may add another layer of activity into our Prehistoric landscape on the heath. What we can say for sure at the moment is that Barrow14 was definitely used as a burial site and we have the urn to show it. Barrow19: What a whopper! This season, this barrow has given us an extra burial urn, waterlogged wooden remains that will help us radio carbon date the construction of the ditch, two Bronze Age burial pits (one being the biggest known in the UK), the possible remains of a burnt wooden hurdle and they were still working hard when I left! The team have also lifted the pot that was discovered at the end of last seasons excavations and discovered it was not complete as they had thought. It did however still contain some of its contents so hopefully we will learn more about it after the specialists have looked at it. I think it is safe to say that this season has been busy and exciting with many questions answered and more found to be asked. Although this is the last Daily Dig Diary this is of course not the end of the discoveries as many of the artefacts that have been uncovered as well as soil samples need to go off to be examined and tested by experts in different fields before they give up all the secrets they hold and we have all the answers possible. We will keep you up to date with all of these discoveries when we get them so please keep a look out here for our special updates.